Oh Crap, yet another live-action adaptation of a classic & beloved cartoon is coming our way! 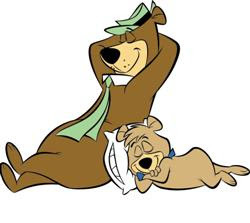 Warner Brothers is developing the Hanna-Barbera cartoon 'Yogi Bear' for the big screen. The film will utilize the same style as past cgi live-action films Scooby-Doo, Garfield, and the most recent Alvin and the Chipmunks. The entire film will be shot in live-action with only Yogi Bear and his little associate Boo Boo in cgi. Surf’s Up co-writer/director Ash Brannon has signed on to direct the project, which will be penned by Tooth Fairy/Surviving Christmas scribes Joshua Sternin and Jeffrey Ventimilia. Do we really need anymore of my childhood cartoons being adaptated in live-action cgi films? Have any of them even been any good? Flinstones, Scooby Doo, Alvin and the Chipmunks, Fat Albert, Underdog and Garfield all sucked a fat one! They took something great and made a heaping pile of crap out of it! What's worse is each film usually had pretty decent casts, but the scripts were so watered down and complete dribble, they were bound to fail. Now comes Yogi Bear, ugh! As a kid, I always loved Yogi Bear, especially his Christmas special, where he teaches snively to become an un-spoiled child at christmas time. I still have the VHS that I recorded off TV as a kid and still watch every year at Christmas (now with my kids). I want to say that Yogi Bear has potential and it could be fun, but the track record of these films is just a huge deterent. Let's just hope Jason Lee doesn't play the Ranger in Yogi Bear! I can see WB pushing hard for Will Ferrell in the role of Park Ranger Smith. I would hope that Ferrell would stay as far away from this as possible. Just ask Matthew Lillard how promising his career has been since Scooby Doo franchise. No word either if Yogi's girlfriend Cindy Bear will be featured in the film. What are your thoughts on a live action Yogi Bear? Have you had enough of the live-action cartoon adaptations? Do you even care, aren't these movies for kids anyways?